This is not another finance book that promises you to get rich quick. Instead, it offers a systematic approach to learn some essential finance skills and to promote good money habits. 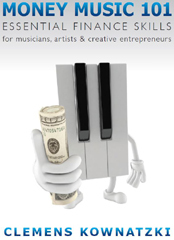 The book is geared towards musicians and artists but it is also full of vital information for a typical young adult entering the work force or about to head for college. If you are considering a career as a self-employed creative entrepreneur or in case you just wish to brush up on your basic financial literacy skills, you will find extremely good value in this book. The author is an investment advisor and a former musician. He can relate to the world of finance from an artist's perspective and is therefore uniquely qualified to teach personal finance in a way that makes sense to someone who has little or no experience with money matters. The book is full of fun and thought-provoking examples showing you how to keep your financial house in order. Ultimately, you will learn the financial strategies that will set you apart from those who live from paycheck to paycheck.